The classic traffic jam logic game. Escape: That's your goal. 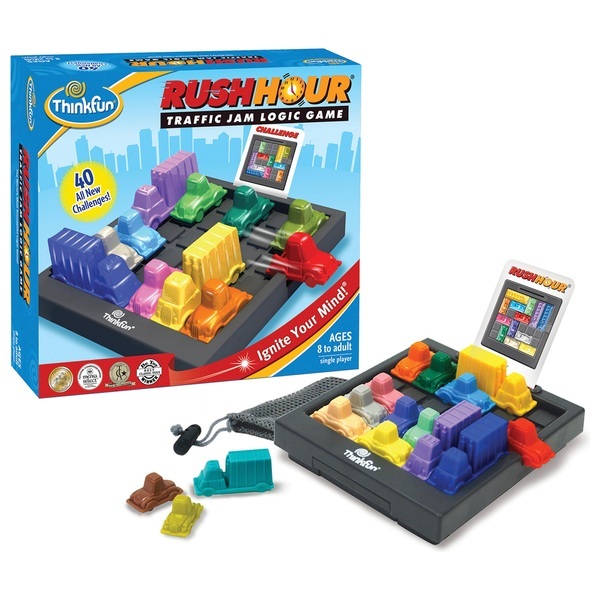 Rush Hour is the premier sliding block game which challenges beginners and experts alike. Rush Hour has 40 challenge cards, which depict various gridlock scenarios to set up your traffic jam to get your Red car through the exit. Slide the blocking cars and trucks in their lanes-- up and down, left and right until the path is clear for the red car to escape. There's only one rule--you can't take pieces off the traffic grid. The game features four levels of difficulty, allowing players to progress at their own pace. With 40 all-new challenges, it's even more bumper-to bumper fun for all ages. The complete move sequence solution is printed on the back of the each challenge card. Rush Hour is an educational game which helps with problem solving skills and develops critical thinking. This game makes an ideal travel game as it comes complete with a Game Go Bag and a built in storage compartment for the challenge cards. Rush Hourcan be enjoyed by single players or various players competing and is suitable for 8 and up.